"How Do You SeparateYour Friends From Your Heroes"
High school journalist Robert 'Gar' Gartland (Haley Joel Osment) has been assigned to cover the town's state championship-bound high school basketball team. 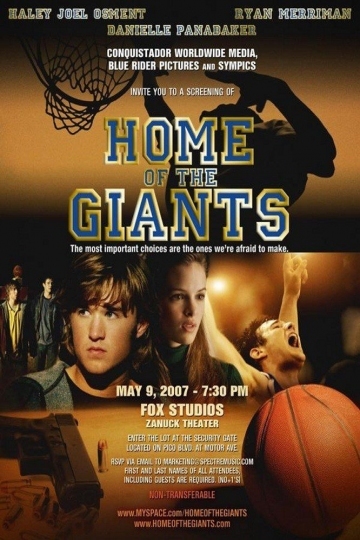 Gar's best friend and all-star point guard, Matt Morrison (Ryan Merriman) is entangled with breaking and entering gone awry. Trapped, Matt and Gar have nowhere to turn. A coming-of-age tale set in the heartland of basketball country Indiana, Home of the Giants is a compelling thriller about the ties that bond friends in the most dire of situations. Home of the Giants is currently available to watch free on Vudu Free and stream, download, buy on demand at Amazon Prime, Amazon, Vudu, Google Play, iTunes, YouTube VOD online.